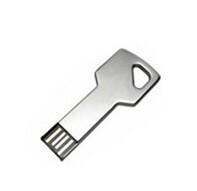 Shaped like a real key, this ultra slim capless style promo USB drive is realistic in style. Best for engraving your LOGO. Ultra slim capless style, realistic key T-shape and size.Special shape Key USB flash drive with rounded rectangular end, available in various colours. It is easily to bring and use for the small size but ultra thin. Equipped with an angular hole that serves to connect accessories. Customisable on both sides with silkscreen printing or laser engraving. Ultra slim capless style, realistic key T-shape and size.